Technology and Dogs Make W-A-L-K-I-N-G Fun! Fall in Indiana is a great time of year. The leaves are beautiful, the air is crisp…what better time to make your dog happy and get some exercise at the same time? Now there is an app available to make walking your dog both fun and informative. MapMyDogWalk by Subaru is a free app available for both Android and iOS. MapMyDogWalk tracks and maps your dog walking route. It keeps track of things like duration, speed, distance, pace, elevation, and calories burned (for you) in real-time. The app uses the built-in GPS technology of your device to create your route on an interactive map which you can save. I have used the app both on neighborhood streets and on paths in Ft. Benjamin Harrison. The app does a good job of mapping both. An additional feature is geo-tagging photo capability, which allows you to take pictures along your walk and automatically upload them with your saved route. When you save your dog walk, the app automatically syncs with your training log on MapMyFitness.com (also free). There, your routes and statistics are saved. There is a multitude of ways to view your statistics. If you are so inclined, you can earn “Achievements” by joining a challenge or by creating your own personal goal. MapMyDogWalk is among a suite of fitness tracking apps, and as such, it can keep track of more than just dog walks. The app can log other types of workouts, log food, and you can share your routes with friends. Dog specific features are drop markers for things such as water sources and poop bag dispensers, as well as videos of dogs driving a Subaru! Exercise is beneficial for our dogs, just as it is for us. 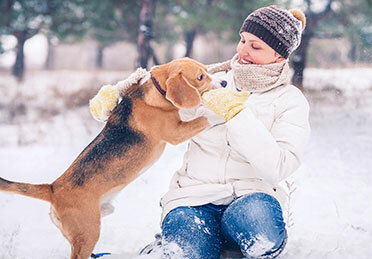 Some dogs have mobility limitations, but if your dog is able, you can mix it up on your walks. Incorporate hills or weaves, and vary surfaces and speeds for a bit of a workout. 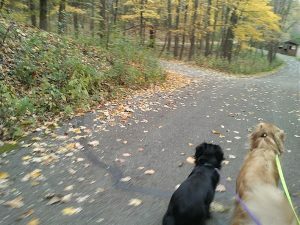 MapMyDog walk will keep track of your elevation changes and pace. If you are motivated by statistics, then this app will do well to motivate you. If making your dog’s day is motivation enough to take him or her for a W-A-L-K, then this app will provide a fun way to log your exercise. 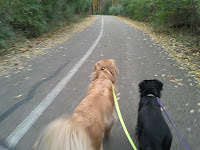 In any case, this is a great time of year to get outside with the best walking companions ever and enjoy the Fall!